VISIONTEK SM34 Three Phase Smart Energy Meter is designed to meter high value residential and commercial segment of energy consumers in three-phase distribution network. 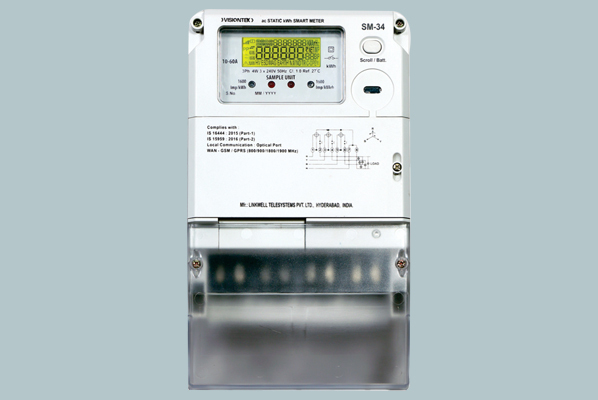 Smart meter is an ac-static watt-hour meter with time of use registers, internal connect and disconnect switches with two way communication capability. It is designed to measure the flow of forward (import) or both forward (import) and reverse (export), store and communicate the same along with other parameters. It can be remotely accessed for collecting data/events, programming for select parameters. Smart Meters enable the utilities to reduce the sanctioned load limit of the consumers by remotely programming the relay in the meter to operate at a lower threshold limit as against complete load shedding in case of emergency/peak load conditions or when the demand is exceeding the supply. Smart Meters also help the utilities to configure the meter remotely, download the TOD tariff remotely into the meter, convert the payment mode from post-paid to pre-paid mode, etc... These features make the Smart Energy Meter a dynamic device in adapting to different conditions as per Utility requirements. Smart Meters not only benefit the utilities with their versatile features but also enable the consumers in managing their loads by interfacing with in-home display units.